Perhaps familiarity dulls one’s perception of what’s seen every day. Perhaps this is why the colors of Alaska amaze me; and Juneau did not disappoint. It’s fascinating that a state capital would, to this day, only be accessible by boat or plane. But that’s Juneau, a city that will fine a person who doesn’t secure trash cans properly — because of bears — before putting them at the curb. Though much more of a metro area than Ketchikan, Juneau, obviously, is still affected by the wild surrounding it. Soon after the Sea Princess was secured dockside, we hopped on an excursion bus heading north out of town. The urbanity that is downtown Juneau faded into suburbs, which in turn dissolved into a thick rainforest. The forest soon gave way to a view of Mendenhall Lake and its source, the Mendenhall Glacier. My first visit to Alaska a few years ago entailed flying into Anchorage, over waters tinged teal, almost turquoise, by glacial silt. 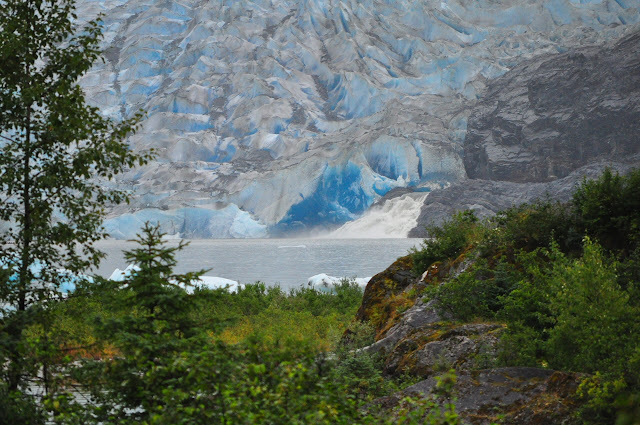 Mendenhall Glacier displayed similarly dramatic coloration, though for a different reason. The blues associated with glaciers arises from the compression of ice over time, its melting and refreezing, which eliminates air bubbles and allows the ice to absorb the longer wavelengths of white light, resulting in shorter wavelengths (blue) being transmitted. Mendenhall was no exception. The Tongass Mendenhall Glacier Visitor Center offered a great overview of the glacier and surrounding area, in both informational and visual aspects. The viewing of a short film and the visiting of various exhibits (and my wife’s visit with a fellow knitter) was followed by a walk near the iceberg-dotted Mendenhall Lake and along Steep Creek. Beaver dam on Steep Creek. Wildlife’s a big part of the Alaska experience, whether one purposely seeks out the wildlife or happens upon it. If my wife hadn’t pointed it out, I might have stepped on a small porcupine waddling on the visitor path. Small and unconcerned, it crossed the path and proceeded into the tall grass. Salmon, with the last slow movements of their life, edged upstream. Though unseen, beavers announced their presence with a network of dams. Then there’s the bear, signaled by the “oohs” and “aahs” and crush of tourists to one side of the elevated walkway. 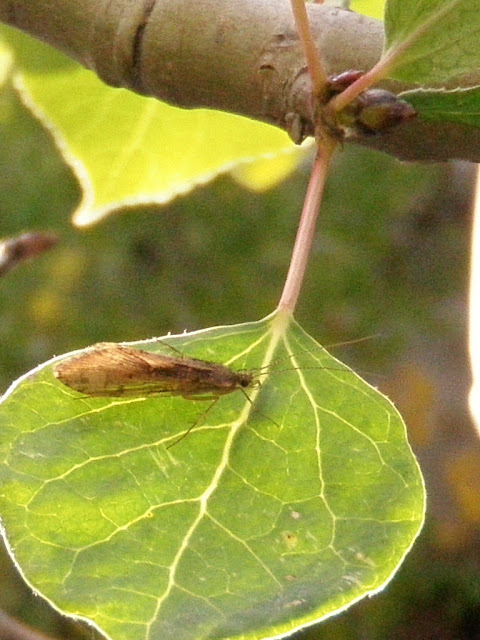 Hidden beneath the leaves of streamside bushes, it waded upstream and swung from side to side, eyeing the water. Slowly, patiently, quietly it slipped upstream, unmindful of the cluster of people above. The sockeye was also oblivious…and soon was the bear’s lunch. 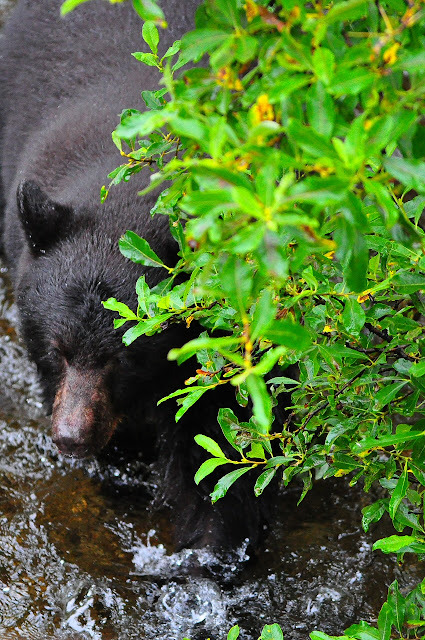 Bear stalking salmon in Steep Creek, near Mendenhall Glacier. The next stop was one that began with concerns that it might be tourist trap: the Glacier Gardens Rainforest Adventure. (The “adventure” part is hyperbole.) Our group met near the base of a mountain among plantings of nonnative plants and unique “upside down trees.” While it’s a touching story of how this botanical garden was as much labor of love as it is a commercial nursery, it wasn’t quite what one would expect on a tour of an Alaskan rainforest. In only a few minutes, however, we gained 300 feet in elevation and, with the commercial nursery far behind us, entered an untouched and lush rainforest. The drive was ably narrated by our knowledgeable and affable guide. Streams trickled under fern fronds. Rain dripped through the canopy. A walkway on the ridge offered a view over Juneau. After lunch back on the ship, we spent time in Juneau as tourists, visiting various stores (focusing on those operated by local families), and stumbling upon the Alaskan Brewing Co. store. It was quickly learned that — and we took advantage of — a shuttle would soon depart for the brewery, where a tour and tasting were offered. If you look up reviews of the Alaskan Brewing tour, they skew toward the positive. Don’t get me wrong, though the “tour” doesn’t entail walking around the actual brewery, the humorous tour guide did cover the entire history of Alaskan Brewing, brewing, and process by which the company develops new beers. I think, however, that the largely positive reviews may be slightly influenced by the generous size (see the photo to the right) and number of free samples. 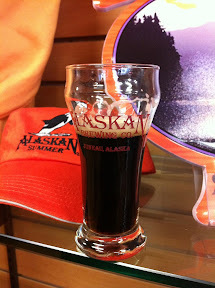 I ended the day with a quick, late-evening walk into town to pick up an Alaskan Brewing glass for the oldest son. 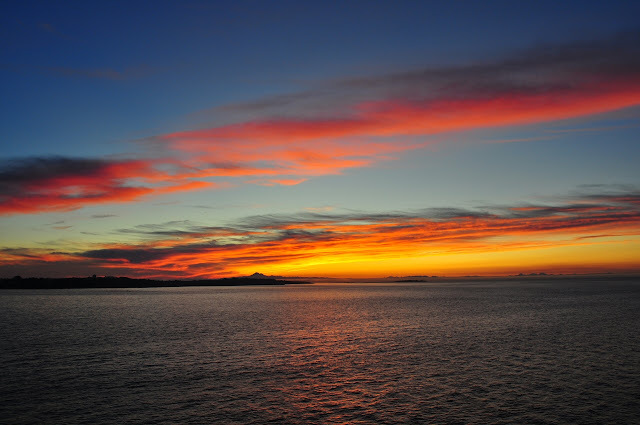 The sun set, the evening’s entertainment was enjoyed, and the ship set sail for Skagway, perhaps my favorite stop. 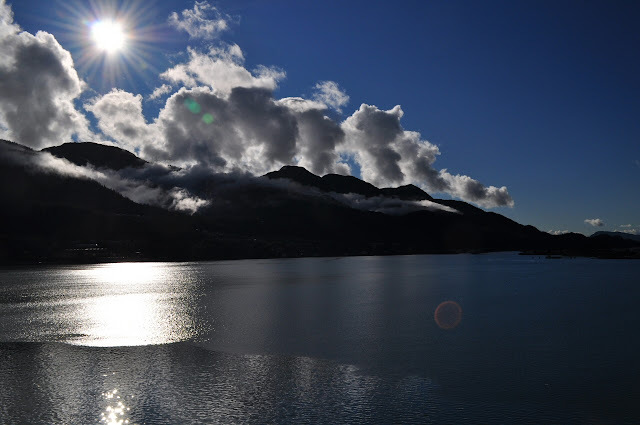 Sun Setting Over Douglas Island (West of Juneau). The Picasa album with all the photos. Categories: Alaska, Photography, Salmon, The Wife, Vacation & Travel | Tags: Alaska, cruise ship, Juneau, salmon, wildlife | Permalink. I was reminded of my childhood when the ship began to dock the third morning of our Alaskan cruise. Years ago my sister and brother and I, still sleeping, would be packed into the car, and we’d wake us up numerous miles down the road. This time it was our captain announcing the successful mooring of the ship and clearance to disembark passengers. Early morning over Ketchikan, Alaska. 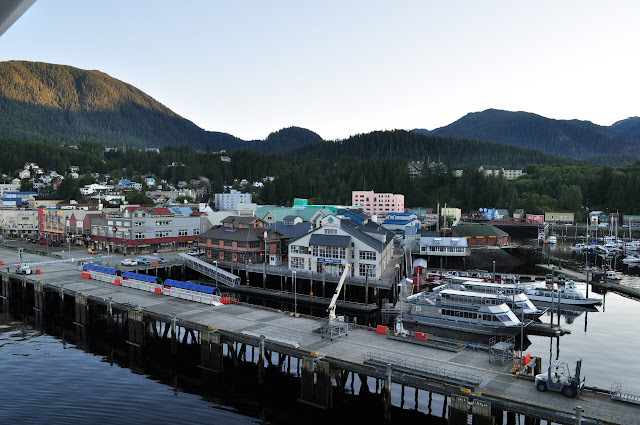 Ketchikan greeted us with sunshine and colorful waterfront shops. The rest of the town huddled between mountains and the sea. Our half-day shore excursion would take us to visit the Deer Mountain Tribal Hatchery and Eagle Center, the nearby Totem Heritage Center, the Saxman Village and the Southeast Alaska Discovery Center. Though it’s no secret that Ketchikan, as well as Juneau and Skagway, owes much of its financial survival to tourism, our guide/driver that morning exemplified the tourist-friendly attitude that would greet us during all of our on-shore travels. 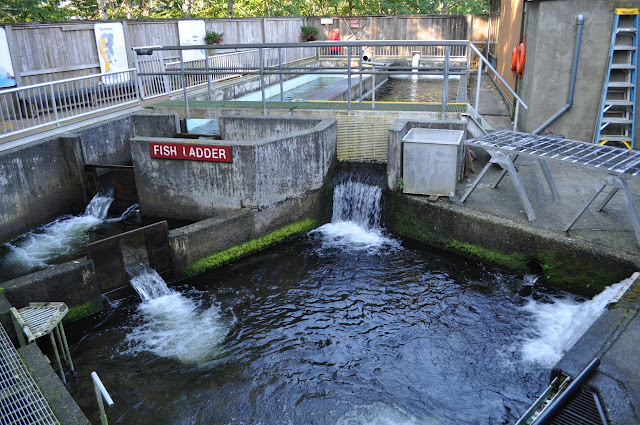 The collection area for salmon returning to the Deer Mountain Tribal Hatchery. 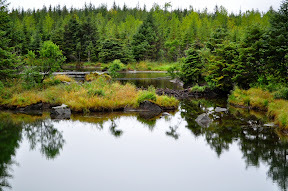 The Deer Mountain Tribal Hatchery and Eagle Center is within a relatively easy walk east of the dock. Our guide walked us through a town park to the entrance of center, next to a creek in which numerous pink salmon milled about. We were greeted by a docent and resident owl, and entered the eagle habitat. To be honest, I was hoping for something, well, a bit more. However, it did offer an up close look at two of these amazing birds, which haven’t been released into the wild due to injuries. A creek running through the small habitat allows them to hunt spawning salmon. The Deer Mountain Tribal Hatchery is just as small in keeping with its mission to ensure the survival of various salmon species rather than supply fish for a fishery. Its operation was well described by the docent, though the distraction of big salmon in a holding pen interfered with my hearing everything she had to say. Perhaps more remarkable was the Tlingit and Haida totems, moved from islands throughout the Inside Passage and now housed a short walk away in the Totem Heritage Center. The unrestored appearance of the totems housed in the center — each 100-plus years old — lend a sense of history. Small, surrounding exhibits cover Tlingit and Haida history and traditions. Totem in Saxman Village on a nice sunny Alaskan day. 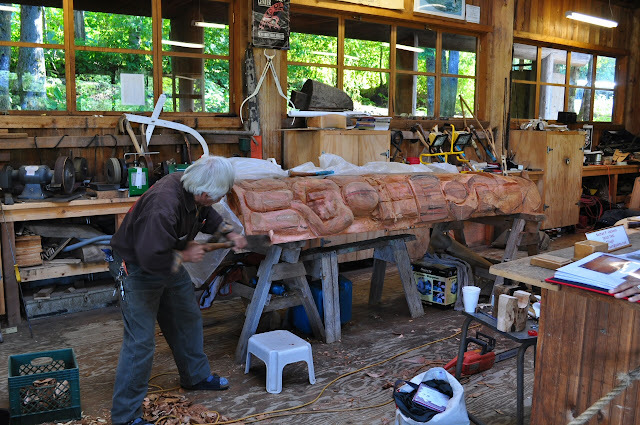 We next visited Saxman Village, a tour highlighted by a carving demonstration and nearby totems. Of note is the Seward Shame totem built to shame the former U.S. Secretary of State for not repaying a Potlatch (a gift-giving festival) to the Tlingit people. While the color red is used to indicate shame, indicating stinginess, red also figures prominently on the nearby pole built out of respect for Abraham Lincoln* and commemorating the U.S. Revenue Cutter Lincoln in its role in helping two rival Tlingit clans establish peace. Back in downtown Ketchikan, we were dropped off at the U.S. Forest Service’s Southeast Alaska Discovery Center. Worth a visit, the Discovery Center offers displays and information covering a wide swath of the area’s natural and human history, and might have offered a better starting point. Lunch in Alaska is simple for me: various versions of halibut fish and chips, this time in view of Ketchikan’s Thomas Basin Harbor, at the south end of town. We’d been warned that all three of our ports of call had been invaded by jewelers who typically started their businesses in other, more tropical cruise ship destinations. My wife, in fact, already wanted to look at a particular ring. I hadn’t been warned about the sales folks. They are smooth and slick. It all starts with an innocent question: “What do you think the price is?” Let’s just say it was too much, even with the initial offer of a discount, but it must have been apparent — in our eyes or maybe our body language — that we had no plans to buy. Another substantial discount raised my eyebrow. I’m terrible at picking out jewelry and recently began an early search for a suitable ring for our 10th anniversary, which is not too far off. I was having a heck of a time. But again, I went into a defensive huddle with my wife, shaking my head with such exaggeration that another offer was made. Earrings were thrown into the deal. The sales manager stepped up with calculator in hand. I’d even go so far as to say we had the original salesman sweating, just a bit. Another huddle, another offer, the incorporation of sales tax into the offered price, and a deal was struck. I was hoping to see ice in Alaska, and I thought it would be in a glacier, but regardless of the profit earned on the sale, we walked back to the ship feeling we’d done okay. 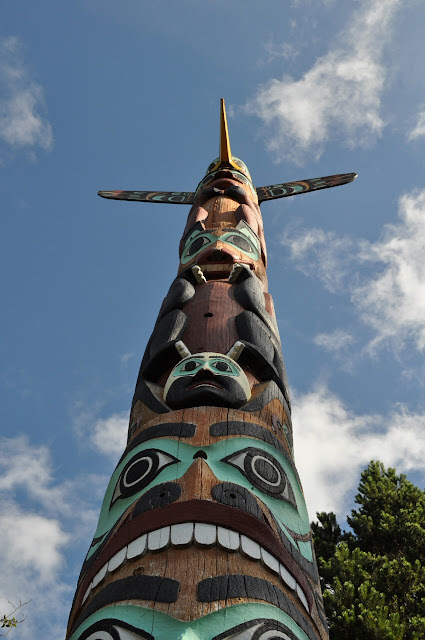 * This one is different from the Lincoln Totem in the Alaska State Museum. Categories: Alaska, British Columbia, California, Canada, Family, Food & Wine, The Wife, Vacation & Travel, Washington | Tags: Alaska, beer, cruising, Ketchikan, photography, vacation | Permalink. There are a few notable things about taking a cruise that make me feel good: massages, a disconnection from everyday demands and the fact that it’s relatively certain I’ll be part of the younger crowd. Lump in the fact that your hotel room is hauled from port to port while that someone else does the driving, often while you’re asleep, and it’s a pretty sweet deal. One has to step away from the food, onboard boutiques, entertainment and the Internet café to truly experience this timelessness of travel by ship. My wife and I found ourselves relatively undisturbed during a long, afternoon walk on a lower deck, much of that time watching the ship’s prop wash disappear over the horizon. We embarked in San Francisco after a short ride from home, courtesy of the in-laws. One overriding factor in choosing this longer cruise — my dear wife will tell you I wasn’t initially convinced it was worth the extra cost — was that it didn’t require violation screening by the TSA or limits on luggage…we could’ve have taken a ferry across the bay, then walked from the San Francisco Ferry Building to the cruise terminal. Checked in and familiar with our stateroom’s location on Aloha Deck (11), we familiarized ourselves with the ship courtesy a scavenger hunt. It was helpful to my waistline that our stateroom’s location would require going up or down at least two and often four or five flights of stairs to reach most destinations. 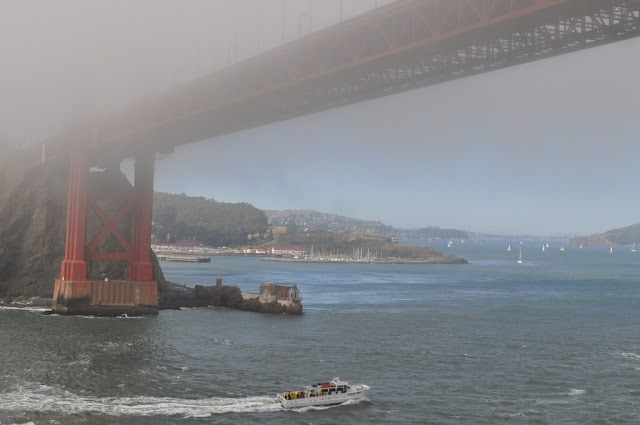 The weather was fantastic for our departure; a bluebird sky, sunshine and wisps of clouds over the bay…at least until we got to the Golden Gate Bridge. Very little of the bridge was visible, but no matter how little of the bridge we saw, it was from a unique perspective. With the ship headed out to an overcast sea, we unpacked, settled in and prepared for dinner. My wife was most excited that evening to receive her Princess Patter, the ship newsletter, which offers a list of shipboard activity the next day and a column written by various ship’s crew. Our first two days would be at sea, something that’d be unremarkable without knowing that I’ve been prone to seasickness. While Sea Princess — with a length of 856 feet, beam 106 feet and gross tonnage of 77,000 tons — is big ship, 11-foot swells can give a slight pitch to the deck. 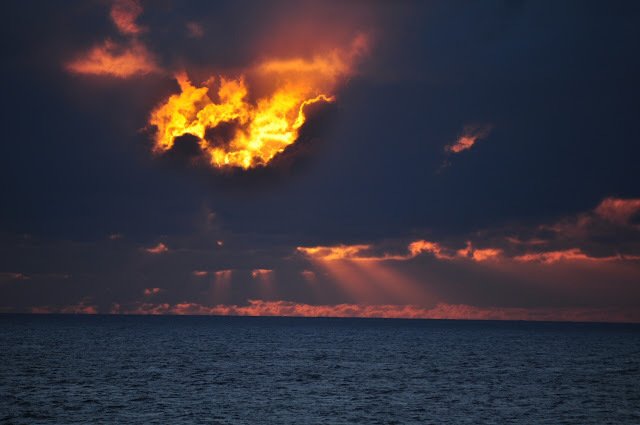 My apprehension faded away the morning of the second day, when I seemed to have gotten my sea legs. Even so, I still find it a bit disconcerting to jump on a treadmill in the morning to see the sea go by in a direction perpendicular to the direction you’re walking. That second day I planned to meet with the maître d’hôtel in the morning regarding our dining arrangements. Our original reservations provided for anytime/flexible dining, but before embarking we had requested a switch to traditional dining. The first evening we were reminded that anytime dining really isn’t that flexible, not being served until well after 6:30 p.m. Apparently I made the maître d happy. My request to change to traditional dining came without caveats and with a willingness to share a table with others. Yes, my wife and I dine well with others. We filled that second day visiting the gym, learning the ship’s layout, confirming spa appointments and attending seminars; some informative, others part of the up-selling that comes with cruising. During a visit to the cabin in the late afternoon it was learned that I’d be wearing long pants to dinner. We had been moved to the first seating (5:30 p.m.) in the traditional dining room. We didn’t know that fate had a surprise in store. We were seated at our table, with room for six, before anyone else. Eventually, a couple sat down with their daughter and son-in-law, and introductions commenced. Shortly, however, it grew clear that they had expected another daughter and her husband to occupy the seats now filled by us. Speculation that the daughter hadn’t been able to get her dining assignment changed was soon rendered moot when she appeared, revealing that she did secure a change to traditional dining but hadn’t been able to get an assignment to their table. With a little push from my wife and I, and agreement from the head waiter, the daughter accepted our offer to switch table assignments. We were presented to our new tablemates, among whom, as luck would have it, was a gentleman my wife had come to know on cruisecritic.com. It quickly became clear we’d all get along when John commented that had he seen us coming, he’d have said “no” to new tablemates. We’d end up spending every dinner and many evenings with John and his wife Connie, and Gene and his wife Maydean. That was also the evening that we began an eight-night tradition of evening entertainment courtesy of cabaret singer/pianist Sammy Goldstein. With an excellent start to this cruise, I was looking forward to our first stop: Ketchikan, Alaska. * There was a contest among ocean liners to capture the trans-Atlantic speed record that led to a top speed of 43 knots (held by the SS United States), but the line is now blurred between ocean liners and cruise ships, and most maintain a cruising speed closer to 20 knots. The only ship comparable to an ocean liner of yore is Cunard Line’s Queen Mary 2, which has a top speed of 30 knots but typically cruises at 20 to 26 knots. Categories: Alaska, California, Family, Oregon, The Wife, Vacation & Travel, Washington | Tags: Alaska, California, cruising, family, photography, vacation, Washington | Permalink.